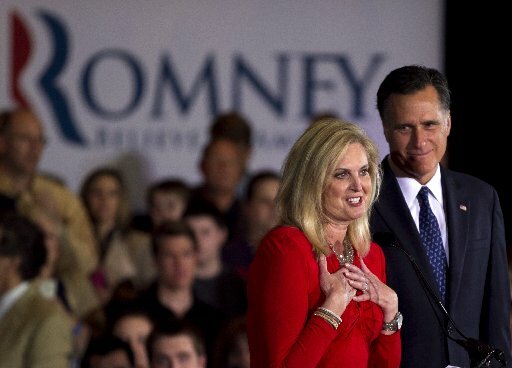 The Midnight Review: Ann Romney To Critics: "I Choose To Be Unemployed!" Ann Romney To Critics: "I Choose To Be Unemployed!" "My maids work very hard so I am perfectly aware of what the average woman goes through." Mitt Romney has been using his wife, Ann Romney, as a campaign surrogate to try and gain traction with women voters, claiming his wife was a perfect example of the average American woman - a hard-working stay-at-home mom - so it wasn't a surprise when someone spoke out against the latest Romney campaign meme. Democratic strategist Hilary Rosen made a comment about the aspiring first lady while on CNN's Anderson Cooper 360. This, of course, has caused an uproar on the right. For example, Katie Pavlich's headline at Townhall.com was as follows: "Obama Advisor Attacks Cancer Survivor, Mother, Grandmother Ann Romney"
Seems that "advisor" label is sticking with conservatives. The Romneys have also hit back with Ann saying she made the "choice to stay home and raise five boys" and son praising his mommy. The Romney camp also tried to link these comments to the president by calling Rosen an "Obama advisor" despite the fact that she is employed neither by the Obama campaign nor the Democratic National Committee. Rosen clarified that while being a stay-at-home mom is hard work, she was commenting on the fact that the multi-millionaire's wife wasn't faced with the real world challenges facing the average mother. Ann didn't have to go to work because her husband was worth a couple hundred million dollars. Tell that to a mom of one who has to get by on a part-time job to scrape by. Also, average mothers also don't have access to numerous maids - even with the kids all grown the Romney's claimed four maids in 2010! The Obama campaign has already tried distancing themselves from the comment by praising mothering and declaring families off limits, but does that count for campaign props like Ann, and then look at the defense coming from the right - Pavlich ends her little rant by stating "stay at home moms are worth at least $500,000 per year." Maybe this is why Romney is claiming he can relate to the average woman - in his eyes a stay-at-home mom is part of the one percent.